NEW YORK (CNNMoney) -- Isn't it fun to be a New Yorker? There's the rotten weather much of the year, dirty subway stations, packed restaurants and grid-locked streets. And really high home prices. According to four residential real estate market reports released Friday, this year the typical Manhattan home buyer shelled out about five times as much as the average American paid for a place to live. "The New York market is strong compared with the rest of the country, but that's not saying much," said Jonathan Miller, president of Miller Samuel, the premiere local appraisal firm. The Manhattan housing market is considerably off its peak. 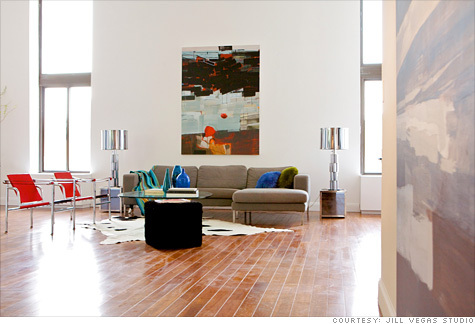 Back in late 2008, buyers paid an average of about $1,400 a square foot for a condo or co-op. The average price this year was a little over $1,000. That may be a cool million dollars for a 1,000-square-foot apartment, but it still means home prices have fallen nearly 30%. The median price for homes sold during the first three months of 2011 fell 2% to $800,000 year-over-year, according to the Corcoran Group. Brokers Halstead and Brown, Harris, Stevens both say the situation was worse, citing prices falling 4% to $787,500. Miller, who produces the report for Prudential Douglas Elliman, said the median price fell 10% to $782,071. That drop was a bit deceiving, though. He said the mix of apartments sold changed significantly this quarter compared to the first quarter of 2010. In those months, about half of all homes sold were cooperative apartments and half were condominiums. This time, though, the mix was 60-40 in favor of co-ops. Condos, however, sell at a big premium to co-ops -- a median of $1.15 million compared to $642,000 -- and Miller thinks the increase in co-op sales accounts for most or all of the price difference he recorded. The real estate market has followed, more or less, the trajectory of the local economy. Hiring, for example, has been less than robust in town and the unemployment rate has hovered in the region just below 9% for a number of months. It was 8.9% in February. "Wall Street is progressing nicely," said Greg Heym, an economist who puts together the housing reports for both Halstead and Brown Harris Stevens. "That bodes well for the future of housing here." Miller does not expect much market volatility for the rest of the year. "We're not seeing prices rise very much and we're not seeing them fall very much," he said. "It's a post-stimulus housing market and it will be on the weak side: 2011 will be rather boring."